LA CENTER — When Hailey Grotte started swimming for her high school team, she was the high school team. Since then, a couple more swimmers have joined her. Next year, she is hoping for four so the La Center Wildcats can have a relay team. No matter, it is sure to be a very strong team. 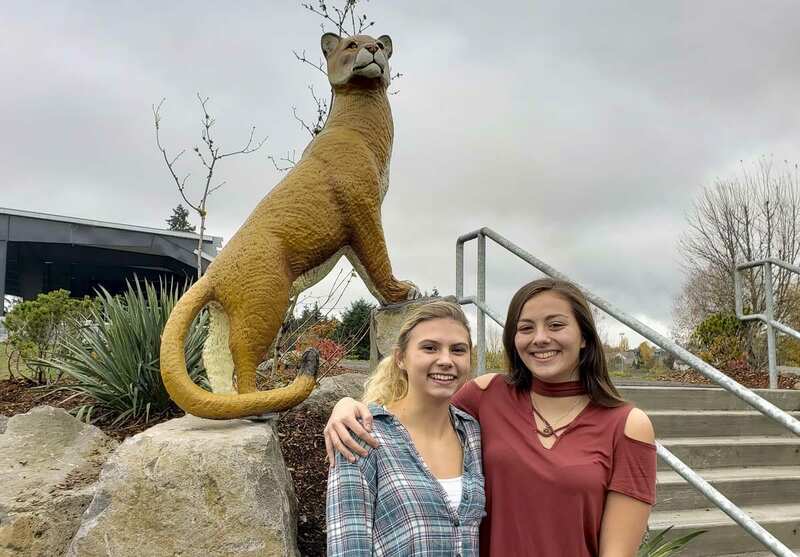 Grotte, now a junior, and Bryanna Ungs, a sophomore, both have qualified for the Class 2A/1A WIAA girls state swimming championships, which are Friday and Saturday at King County Aquatic Center in Federal Way. They did not just qualify, by the way. They qualified with some of the best times in the state. Grotte, who finished second in the 50-yard freestyle and 100 freestyle last season, is ranked second in both events this season. Ungs is seeded No. 1 in 100 breaststroke and No. 2 in the 200 individual medley. “People are just now starting to notice we are fast swimmers,” Ungs said. Grotte and Ungs have known each other for years. They swim on the same club, NW Blue Crush Aquatic Club. Last year, Ungs became a freshman and joined the team, as did Rebekah Skufca, giving La Center three athletes on the squad. The Wildcats train with Hockinson swimmers. In the past couple of years, the size of their combined team has doubled. Grotte and Ungs both take time off of club during the high school season. About the only drawback is the schedule. The Hockinson/La Center team practices at night at the YMCA in east Vancouver. “You don’t get home until around 10 p.m.,” Ungs said. It is all worth it, though, to represent La Center at state. A year ago, Grotte finished second place in both of her events. She is seeded No. 2 this year, behind the defending state champion: Eleanor Beers of North Kitsap. “I definitely think it’s possible for me to beat her,” Grotte said, while acknowledging this might not be the year. Both are juniors. Due to a change in her training regimen, the timing might not be perfect for Grotte to catch Beers. Ungs finished in the top five in two events last year. “Last year was my first year. I had no idea what it was going to be like,” Ungs said. She saw all the competition from the Puget Sound area, saw how fast they were. Now, she is ready to compete. Figuring out college is still a ways off for Ungs. Grotte is already thinking about college swimming, too. When these two do head off for college, in their bios it will say they were swimmers for their club team, and for their high school. Yes, La Center has a girls swim team. Two are state-bound this week. Perhaps if La Center can add one more athlete, this time next year there could be a La Center relay team or two at state. Washougal: Lily Seitz (200 individual medley); Kaylyn Schmid (50 freestyle, 100 breaststroke); Charlotte Baker (100 freestyle, 100 backstroke); 200 medley relay, 200 freestyle relay.